Alternative laundry drying solutions are the focus of this article that begins our series on compact and portable dryers. The conventional, big 220V dryers that require a ton of space and ventilation that isn’t possible for everyone. Small apartments or studios, recreational vehicles, travel trailers, and any other small living space often doesn’t have room, or even the required connections, to hook up a full-size clothes dryer. Large families produce a ton of dirty laundry and maybe you need an extra dryer to supplement your full-size dryer, but don’t have the room to add another 220V dryer. We’ve outlined some solutions below and you’ll find a link to our more in-depth guides and reviews on each category. Tumble dryers are the most familiar. They spin with a horizontal rotation, like a tire rolling down a hill or Ferris wheel, and the laundry falls as it slides off the ribs on the wall of the dryer drum. The falling effect helps to “fluff” the laundry and flip it to make sure as much surface area of each article of clothing is exposed to the hot air inside the dryer. Require 110V-120V instead of 220V-240V. 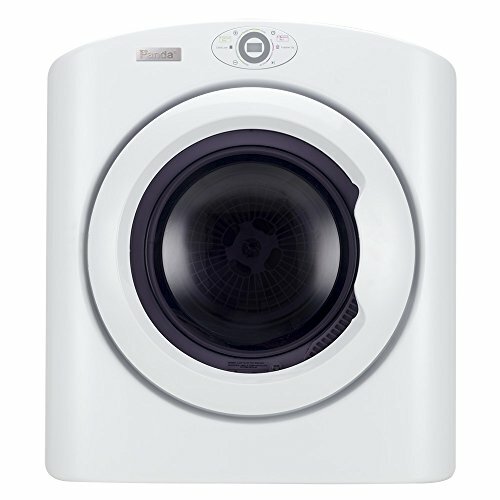 Spin dryers spin vertically, like a kitchen mixer, and the laundry is pushed against the wall of the dryer drum. This is also how laundry washing machines extract water from laundry after the wash cycle is complete. This drying process does not remove 100% of the water, so you will need to hang laundry to complete the drying process. These dryers drastically reduce the time needed to hang dry laundry. Spins fast and removes 80-90% of the water from laundry. Additional drying required. Most people hang dry to finish. Reduces hanging time needed to complete drying process. Electric Hanging dryers are great if your RV doesn’t have space for a dryer. They’re essentially like a small space heater that blows air into an enclosure with your clothes inside. They’re collapsible and can be stored away. Heated racks, some with enclosures, that dry your laundry faster than hanging alone. Small footprint, and easily stored away when not in use. These alternative dryers all come with their own pros and cons. Full-size dryers, typically 5.0 cubic feet or higher drum volume, are convenient because of the amount of clothes they can dry at once. However, they take up a ton of space and require proper venting. RV’s and travel trailers certainly don’t have space for a full-size washer and dryer, but there are more compact options. For that, small volume tumble dryers are a convenient and familiar option, spin dryers and heated racks are a reasonable compromise if you just don’t have the room for even the smallest tumble dryer. Now, 110V tumble dryers are an excellent option for any situation when a 220V plug isn’t available, nor the space to fit a 220V dryer. There are a few different sizes available for 110V dryers, and they can even get small enough to fit on your kitchen counter. Portable and compact dryers of all types dry slower than full-size, traditional tumble dryers. It just comes with the territory since when you reduce size and power that also increases drying time. Beyond that, there is some overlap between what is considered “portable” and “compact.” Even the largest compact dryers can be portable as long as you have somewhere to put them, such as in an RV or boat. If you live in a small studio apartment, or in a home that doesn’t meet the plumbing or electrical requirements for a traditional dryer, then don’t worry. There are options here for you. These key points will give you a more informed outlook when deciding which type is right for you. Compact tumble dryers take up less space, but still produce heat that can optionally be vented outside. Spin dryers are recommended if you don’t want to deal with the heat from a tumble dryer, and don’t mind hanging clothes to dry. 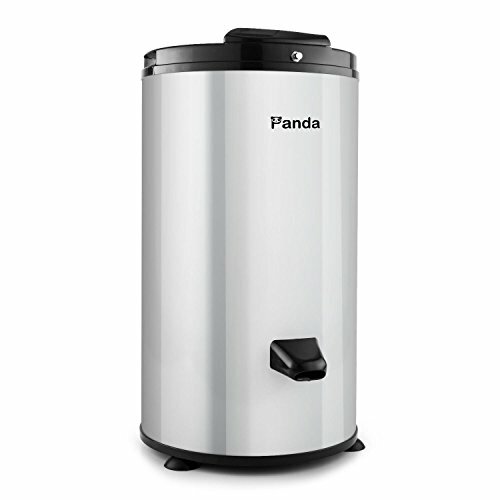 When we refer to compact and portable tumble dryers we’re talking about 110V dryers. “Compact” and “Portable” are subjective terms, but most manufacturers refer to tumble dryers with a capacity smaller than 5.0 cubic feet as compact. For portability, consider staying under 3.0 cubic feet. There are compact 220V tumble dryers, but these are not what we would consider portable. If you’re in an apartment that has a 220V plug but lacks the space for a full-size dryer to fit comfortably, then they might work for you. So, we have portable dryers that come in a variety of forms and compact tumble dryers that look like miniature traditional dryers. These compact tumble dryers are meant to be installed in a more permanent location than the portable options above, and they all only need 110-120V power. 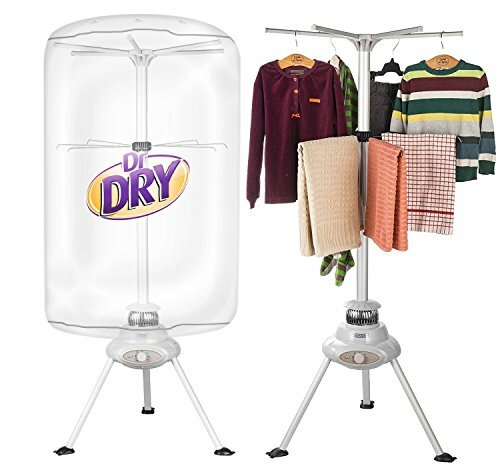 This is great for studio apartments or if your housing just doesn’t have room or power capabilities for a full-size 220V clothes dryer. Also, consider these if you need more drying capabilities. The capacity of standard washers and dryers are usually given in units of cubic feet and is the total volume of the drum. You can use the following formula to calculate the volume of your dryer or washer drum. You need the radius of the drum and the height. Measure the radius from the back center of the drum and measure the height from back to front. A good rule of thumb is that you want your dryer to have twice the capacity of your washer to be sure that the dryer can handle the maximum load of the washer. With a compact dryer, you’re going to be dealing with less capacity, and it’s a good idea only to wash what your dryer can handle or be willing to hang dry some of your laundry. What fantastic technology gets rid of the heat, lint, and moisture produced by the dryer? Well, that’s not really how it works. 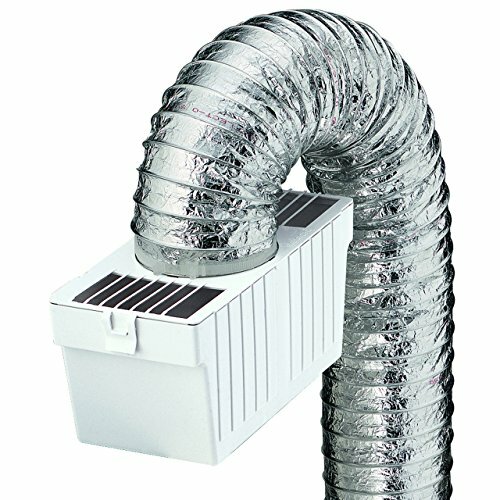 The ventless models don’t require you to vent the exhausted air outside of the room where the dryer is located. The internal filter captures the lint, and the hot air is just released into the room. That might sound bad, but remember these dryers are much smaller than what you’re used to. You’re dealing with 800W to 1500W, which isn’t much more than a typical space heater. However, if you’re in a small space, this can be a problem in the summer. In the winter, it’s a good thing! 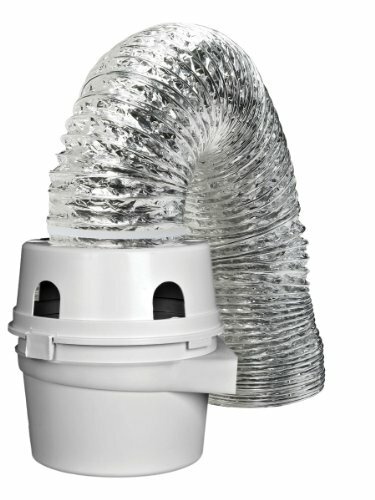 If you’re not able to run a duct in the location you’re putting the dryer then these ventless dryers are a great option. Compact tumble dryers fluff your laundry and completely dry it in a reasonable amount of time, but unless you can vent them outdoors, they will still heat up the room they’re in. 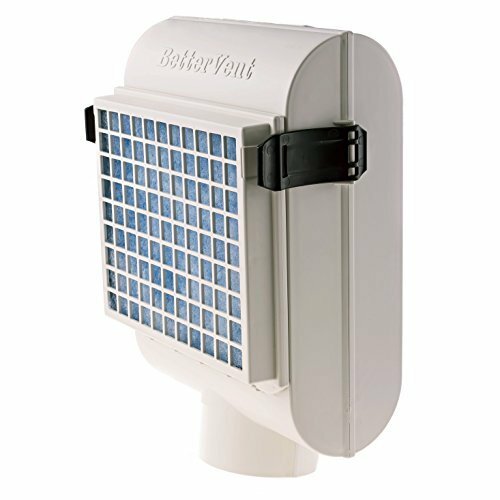 They generally operate around 800W to 1500W, which is equivalent to a typical space heater. Most people don’t have complaints about the additional heat, so it’s not something to worry too much about if your other alternative is going to a laundromat. One of the great things about these dryers is they can go in any room, or if you have a porch, you can just set it outside when you need it. The hanging dryers produce a similar amount of heat, so they’re not a “better” solution in that regard. Spin dryers are the only heat-free alternative.